Point observations, such as temperature profiles from eXpendable Bathy Thermograph (XBT) systems, have been used by navies for many decades to infer the acoustic properties of the water column. These observations are relatively simple to make, and do not require assistance from ashore. This approach amounts to a persistence forecast, that is, an assumption that the water properties will not change during the period for which the assessment is required. It also assumes that there is no spatial variation in temperature, so only range-independent sonar predictions can be made using this approach. Persistence forecasts can be expected to have lower errors than climatology at the start of the forecast period, but as the oceanic flow evolves from this initial state, the errors grow rapidly (Murphy 1992). 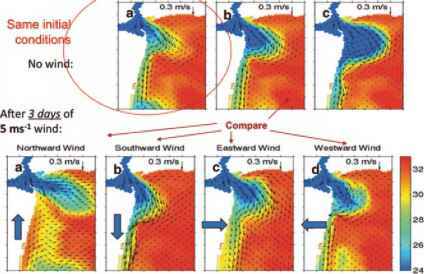 Spatial variations, caused by the physical movement of the ship or aircraft making the observation, as well as temporal variations due to ocean dynamics, contribute to these errors. Nonetheless, a persistence forecast may be useful where uniform conditions can reasonably be expected, such as in high latitudes where mixed layers are very deep, or over continental shelves, provided the water is well mixed, and advection is minimal. Persistence is a more valid approach for short lead time forecasts, such as may be required for a Co-ordinated Anti-Submarine EXercise (CASEX) lasting two or three hours, than for longer lead times. Nevertheless, where spatial and temporal variability is great, such as in the waters around Australia, a persistence forecast may be misleading even on very short timescales. An ASW frigate which makes an XBT observation just inside or outside an eddy, for example, may soon experience very different acoustic conditions from those inferred from the XBT observation.